The Pennsylvania Railroad Company (PRR) is incorporated, uniting several early rail lines under one company. By the end of the century, the company will control nearly 10,000 miles of railroad, covering most of the Middle Atlantic and Midwestern states. The PRR’s main competitor is the Vanderbilt family’s New York Central Railroad, which controls the only rail access into Manhattan, gaining access from the north across the Harlem River. Industrialist DeWitt Clinton Haskins makes a first attempt to build a rail tunnel under the Hudson River. The riverbed's soft, silty consistency makes construction a challenge and the tunnel suffers a series of blowouts, one of which kills 20 people. Haskins aborts the attempt after more than a decade of work. The PRR launches the Pennsylvania Limited, a luxury train running between New York and Chicago. Like all other trains running west of the Hudson River, however, it has no direct access to Manhattan and must rely on ferryboats. Gustav Lindenthal secures a federal charter to build the North River Bridge. The $100 million project, which calls for a triple-decker bridge with 14 tracks spanning the Hudson River, will be abandoned in 1900 when the PRR fails to convince its competitors to share construction costs. Lindenthal goes on to complete several other bridges, including the Queensboro Bridge, completed in 1909. Pennsylvania Railroad Executive, Samuel Rea studies the South London Railway, which uses electric trains in its subway system, and proposes a similar system as one of five methods the PRR could use to establish a rail connection to Manhattan. Charles Jacobs begins work on the Long Island Railroad's tunnel under the East River. Hampered by fatal accidents and the financial setbacks of the Panic of 1893, the project is abandoned before its completion. Jacobs will later serve as the chief engineer for the PRR tunnel project. New York's population reaches 3.4 million. Coming out of a 17-year retirement, Alexander Cassatt returns to the place where he spent his early engineering career and becomes president of the Pennsylvania Railroad. One of his goals is to implement his vision for a more modern railway system in the U.S. The Pennsylvania Railroad gains control of the Long Island Railroad (LIRR), expanding its New York infrastructure and making rail access to Manhattan even more crucial to the company's success. While visiting Paris, Alexander Cassatt visits the Gare d'Orsay at Samuel Rea's suggestion. The station, the world's first electric rail terminal, opened the previous summer. The visit helps convince Cassatt that by using electrified tunnels, the PRR will be able to establish access to Manhattan. The PRR's board of directors agrees, and decides to build tunnels under the Hudson and East Rivers that will connect to a new rail terminal in Manhattan. On behalf of the PRR, the Stuyvesant Real Estate Company quietly begins buying land in Manhattan's West Side Tenderloin neighborhood. The PRR keeps its plans secret in order to acquire the land at the lowest possible prices. This is where they plan to build the terminal. Alexander Cassatt publicly announces the Pennsylvania Tunnel Extension and Terminal Project, at an estimated cost of $40 million. The news comes as a surprise to many people who expected the PRR to build a bridge. August Belmont, Jr., establishes the Interborough Rapid Transit Company (IRT), which will build New York's first subway lines. Alexander Cassatt hires Charles McKim to design the Manhattan rail terminal. The architectural firm of McKim, Mead & White is known for its 1887 design of the Boston Public Library and other Beaux-Arts buildings. 557 W. 32nd St. is the first building demolished to make way for tunnel construction. Some 500 buildings covering 28 acres were demolished over the course of construction. Workers begin drilling a 55-foot shaft on Manhattan's West Side. The shaft and its companion in Weehawken, New Jersey, will be the endpoints of the Hudson River tunnel. Construction begins on the East River tunnels. 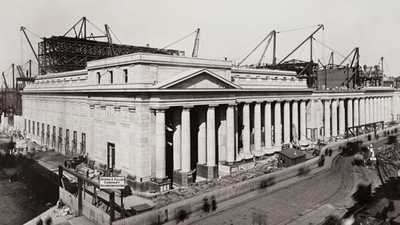 Excavation begins on the site of Penn Station. Workers dig 75 feet down into Manhattan bedrock. The first section of the IRT subway opens, and a reported 150,000 riders test it out. Work on the Hudson River tunnels pauses temporarily after engineers notice the tunnels are moving in the water. Two workers die in a tunnel accident, which sends a 40-foot geyser of muck out of the East River. More than a dozen workers will be killed by the time the tunnels are completed. Many are victims of the bends, or decompression sickness, after working in the underwater tunnels. Workers connect the two ends of the first Hudson River tunnel. After two years of digging, the alignment is only off by 1/16 inch. Two days later, engineers and reporters walk through the tunnel for the first time. The second tunnel is completed a month later. Alexander Cassatt becomes the fourth PRR president to die in office. James McCrea succeeds him. Samuel Rea lays the cornerstone of Penn Station at the intersection of 7th Ave. and 33rd St. A copper box containing the project's history and plans is buried inside the cornerstone. PRR engineers determine that tides are causing the tunnels to shift, paving the way for a decision not to install screw piles directly into the bedrock as previously planned. The first East River tunnel is completed. Workers connecting the two ends of the tunnel send a toy train through, the first train to use the new tunnel. The final East River tunnel is completed, ending the underwater portion of the construction project. Westinghouse is awarded the contract for tunnel electrification, using direct current (DC). Earlier that year, the company collaborated with Baldwin Locomotive Works to design a new electric train. 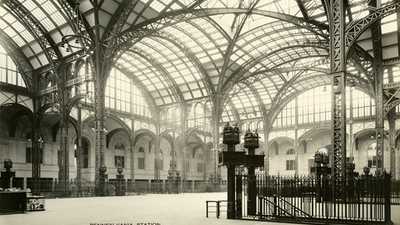 PRR officials decide on a name for the new terminal: Pennsylvania Station. Engineers complete the first test runs through the East River tunnels. The LIRR is the first train line extended to Penn Station, though passengers are not yet using the main areas of the station, which will open several months later. Easy rail access to Manhattan will fuel suburban growth in Long Island and New Jersey in the first half of the 20th century. By the 1920s, two-thirds of Penn Station's traffic will come from the suburbs. Penn Station is officially opened to the public. Between Saturday night and Sunday morning, more than 100,000 spectators and 25,000 passengers visit the station. The finished structure includes 27,000 tons of steel, 500,000 cubic feet of granite, 83,000 square feet of skylights, and 17 million bricks. More than 100 million passengers travel through Penn Station. For the first time in its 100-year existence, the Pennsylvania Railroad ends the year with a financial loss. The loss is driven by increased operating costs -- specifically the cost of coal -- and a decline in passenger travel from the peak in 1944. The Port of New York Authority takes over the operation of PRR's Hudson River tunnels. New York's WCBS News scoops the news of the PRR's plans to demolish Penn Station and build a new sports, entertainment, and office complex on the site. The company will make the official announcement on July 26. Six modernist architects form Action Group for Better Architecture in New York (AGBANY) to oppose the demolition of Penn Station. Demolition of Penn Station begins. Over the next five years of demolition and construction the station will remain open to passengers. New York City establishes the Landmarks Preservation Commission to prevent other notable buildings from suffering the same fate as Penn Station. 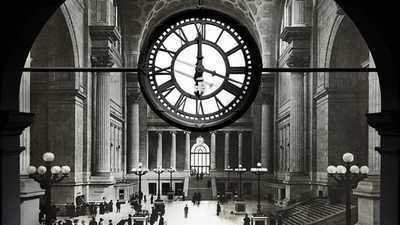 Grand Central Terminal is designated a historic landmark. Madison Square Garden's bowling center is the first part of the new facility open to the public. Pennsylvania Railroad and New York Central merge, forming the Penn Central Railroad, in an effort to cut costs and improve profits. Hampered by increasing maintenance costs and declines in both freight and passenger rail service, the company files for bankruptcy in 1970. Penn Central attempts to build a 55-story office tower above Grand Central Terminal, but the Landmarks Preservation Commission refuses to approve it. In 1978 the Supreme Court will uphold the historic landmark designation, determining that landmark status is not an unreasonable infringement on the rights of a property owner.